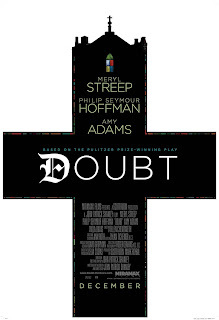 Last Sunday Evan, Jeffrey, Mr. Adam & I went to go see the movie Doubt. I know, I know, you're thinking "ryan charisma, didn't you see that play on Broadway?" Well, yes and Mr. Adam & I loved it. So off we went to see the movie. Meryl Street was phenomenal in this movie. She was everything I remember the nuns to be. Not so much evil, as fun hating. Regardless the movie was adapted for the screen and directed by the playwright. I can definitely imagine Ms. Streep being nominated for her performance this year. It was that profound. My only issue with the movie version of this show is that when I left the Broadway theater after the play, I didn't know what the truth was. And I didn't think one argument was stronger than the other. In the movie version however, I feel that the priest was given more. You sided with him a little bit. Perhaps it's because you got to see the "other" characters in the show? I don't know, but I didn't have that "what really happened?" feeling after the film. But Streep is SO good, you should see this film if only for her, but I promise, you'll like the whole movie none-the-less.